Learn about our pediatric dermatologic conditions and treatments! Dr. Mercedes E. Gonzalez offers unique expertise in the evaluation and treatment of all skin, hair, and nail conditions in newborns, children, teenagers, and young adults. She quickly develops a rapport with her young patients and puts them at ease. Dr. Gonzalez is passionate about the skin and skin disease as well as educating children and families on skin health. She makes complex topics straightforward and understandable. 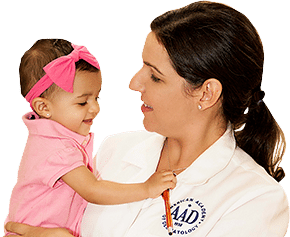 Pediatric Dermatology of Miami offers the latest in the evaluation and treatment of simple and complex skin diseases, including for genetic skin diseases, eczema, acne, severe dermatitis, birthmarks, hemangiomas, hair loss, skin infections, and many other problems. Dr. Gonzalez is fellowship trained in pediatric dermatology and holds 3 board certifications. She is board certified by the American Board of Dermatology in dermatology and the subspecialty of pediatric dermatology as well as by the American Board of Pediatrics. She belongs to an exclusive minority of dermatologists who have earned their certification in dermatology and pediatric dermatology from the American Board of Dermatology, which sets her apart from other pediatric dermatologists in the area. Mercedes E. Gonzalez, MD, is affiliated with TopLine MD and is a founding physician of the Pediatric Center of Excellence in Coral Gables, Florida. We offer many in-office procedures including skin biopsies and laser and surgical removal of warts, moles, birthmarks, skin tags, and more. We are able to perform chemical peels and laser and surgical procedures to treat acne, scars, and other unsightly skin problems while maintaining a kid-friendly, relaxed environment. For quality dermatologic care, please request an appointment online or call Pediatric Dermatology of Miami in Coral Gables, Florida today at (305) 667-3152.